Discussion in 'Classic Sesame Street' started by Jennifer, May 12, 2002. All I remember about this sketch is that it involved three people (Gordon was definitely one of them, but I can't remember the other two). They were wearing Victorian era clothing and each doing something different in fast-forward. I seem to remember someone eating a lot and then getting fatter. I know this is vague, but all I know is that it terrified me when I was younger. Weird, since I like watching things on fast-forward now! Man, there is no way I'm looking through all 52 pages of this thread, but among the ones that scared me were the Bert and Ernie in Egypt one (though I simultaneously thought that one was cool at the same time), and absolutely ALL the sketches with Cecille the singin' stop-motion ball with the gigantic mouth. One of the creepiest segments that I remember was where David is dressed as a snake charmer with a turban and all. He is sitting Indian-style between two wicker baskets. The background is that typical gray one they used for many non-street segments. He starts playing some type of musical instrument, like a clarinet, and this haunting Middle Eastern music plays while out of the left basket appears an animated wiggly number 1 and from the right basket a similar number 2. Once the number 12 fully emerges, David simply says "Twelve!". I believe he goes back to playing his music, while slowly he disappears/fades away and is replaced by some type of painting of an outdoor scene with cows and a farmhouse. The other disturbing aspect is that David just sits there staring at the screen without speaking, but for that one line. Hopefully, one day this clip will surface as it was originally a mid 70's clip that was shown well into the 80's. Frodis? As in "I don't wanna fight any more.....I just want to lay down in the grass and be cool" Frodis? If so, you've got an old school Sesame/Monkee freak here, too. Man, that clip FREAKED me out as a kid. I can still hear that tune in my head to this day. The whole clip was freaky. From David's deadpan creepy expression (remember how he just said "12" in that monotone voice?) to the end when the scene faded into the multicolor-changing wiggling 12 that seemed to go on and on forever. I would try to get that tune out of my head each time I saw that clip, but even 35 or so years later, I still remember it. Didn't the background picture change color, too when David faded out? I do remember the scene having cows and such, like a village scene. I kind of remember it looking almost like a fabric pattern or something. Anyway, I'm sure one of these days, it will show up as everything tends to do. Yeah, that's the Frodis that I'm referring to. Got my tickets to their show next month. I remember this swami clip being rather lengthy. I also seem to remember that when David wasn't playing his instrument, there was some type of ambiance noises, maybe cymbals chiming, in the background. I think David's outfit was a combination of gold and red colors, although that memory is a bit fuzzy. 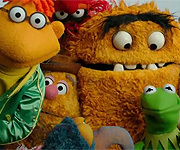 All I know is that it was pretty creepy and after all these years, it's still one of the first things that come to mind when I think of old school Sesame Street. Hope I can see it again (and be disturbed by it again) someday. By the way, I find it interesting that the animated clip of the 4 armed swami counting to twenty also has him morphing into flowers, and in the bit with David, he morphs into some type of outdoor scene. Is that a common thing for a swami to do? heh. Hey Frodis! I see you hooked up with my best friend/fellow Monkee freak Mokeystar! (One tangent here, I never thought I'd see the day Mike Nesmith would put on his wool hat and call himself a Monkee again, but there you are). The David/12 clip didn't scare me, it actually had me mesmerized (maybe the music almost hypnotized me?) but what used to scare me more was that it usually segued into the clip of the 12 rocks in the desert (the little rock that rolls out, sprouts a smiley face, says "Twelve" and sinks into the ground actually freaked ME out). You'd have to go back a number of pages on this thread to my story involving the Scanimate/floating face 10 clip, and a can of paint. It's one for the ages. Ask Mokeystar, she'll be the first to tell you. I've said it before and I'll say it again, it's amazing how so many clips on Sesame Street gave us psychotic nightmares, yet a clip that scared you might not scare me, and vice versa. And no matter how often we got the pants scared off us, we were right back there ready to watch the next day. We just kept coming back for more, scary bits and all. This would make a great college thesis for somebody. I, myself, am deeply jealous. I've seen the 3-kees many times over the years, but never with Nez. I hope you have a blast! "Hook up"? Huh. Okay, anyway, I LOVED the 12 rocks clip, and especially the little guy who would pop in and say "12"! It was so artsy. However, as we've discussed in the past, we always felt nervous when certain numbers or letters were featured because we KNEW they'd show certain clips. If, back in the 70s, you saw the girl pumping up the letter S or saw the animated clip with the guy who screams "STOP!" at the end, you just knew Sammy the Snake (my biggest childhood nightmare behind Beautiful Day) was just around the corner. They would always show the "B" clip with Kermit and B-Day after "Jack and the land of B" clip. An-tic-i-pa-tion gave us heart palpitations but kept us coming back for more. I don't remember what was right before "Nobody" would come on. He was kinda random. Yeah I mean every single day I knew Sesame Street was going to scare me at some point and I was always on guard for it, but at the same time I never wanted to stop watching it, lol. I think that kind of thing happens a lot with more (for lack of a better word) "crude" forms of animation or live action camera work. There's just this inherent roughness that can unintentionally cause unnatural, unsettling images. Early Sesame Street cartoons also had a "Yellow Submarine"-esque look to them where humans have very bizarre movements and unusually long limbs which have a bit of the uncanny valley effect. I was more annoyed by the boring stuff (instrumental classic music set to pictures of pretty flowers... It's relax-o-vision, and it's supposed to be relaxing, but it got me more worked up waiting for it to be over). But for the longest time, I almost swore the horrifying bird animation was either some sort of I dreamed it moment. Nothing could be that freaky and have a purpose. Add to the fact I only saw it once when I was a kid, and never saw it again. Almost seemed like a hallucination. It's probably the pug fugly animation and the REALLY fug pugly expression on the kid at the end. You know what? I think I can predict a future Muppet Central Forum member mentioning Belly Breathe. 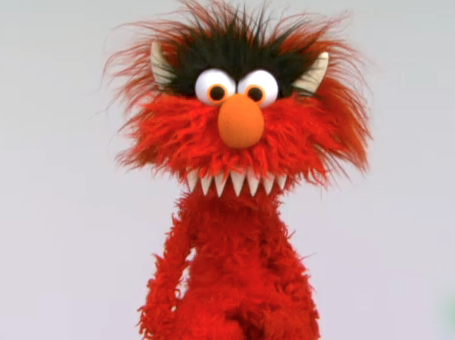 The one where Elmo turns into a deranged monster version of himself? Now, personally, I found Frazzelmo the greatest thing ever in the universe, and I'd buy a T-shirt, plush toy, plastic figure and place setting with that on it. But you just know that's going to scare the crap out of some kid. It's the closest thing to an Elderich Abomination you can have on a kid's show. I believe it. I saw that picture for two seconds and jumped in my seat, lol. Funny thing, though. While I couldn't remember the character from The Muppet Show, I saw a picture of Gloat the Frackle on one of the Muppet record album sleeves. And when I saw that, I thought Gloat was the that thing that happened to Elmo of Kermit. I've tried to look up this one on MuppetWiki, but no luck thusfar. It was a gameshow set on a farm and hosted by Kermit, and one of the contestants was Harry the Haystack, and he made me terrified of farms for the literally the next twenty years or so. Whenever someone talked about a product being made by "local farmers" I couldn't for the life of me understand how that was a good thing, as farms and farmers were scary as heck. Though I'm over it now. Now I actually like Harry the Hopping Haystack a lot, and my toddler age daughter does as well...I guess she inherited her mother's fearlessness. Possibly worth noting, while I assume it was Harry I remember him looking sort of different, having either no eyes or empty sockets rather than charming googly eyes. It was that huge mouth that appeared out of nowhere that really freaked me out. I remember being quite creeped out by the sketch of Ernie and Bert in the Egyptian pyramid when the statue comes to life. One thing that scared me when I was a toddler was the song where the Big Bad Wolf sings about his family. As you can imagine, that one always got me hiding behind the couch, and not looking at the TV, until the song ended! I was also afraid of the "Frazzle" song (mostly because of how he growled before the song started). During my elementary school years, I was scared of the Kermit puppet that was used between the early and late 70's. (It was something about his eyes that freaked me out). I would always hide until he started interacting with Grover, or another character. (Whenever this would happen while I was watching Plaza Sesamo or Sesamstrasse, I would sometimes realize that it was just a skit from the late 70's or sometime during the 80's). There were a few skits that I didn't hide from (a major example being the one where Kermit draws the letter M up on the screen), but a lot of them I always felt the need to hide from when they came on. This also applied to seeing the Season 1 Big Bird and Oscar puppets in the Sesame Street Unpaved book (thank goodness there weren't any photos of Fuzzyface that would soon become Grover, otherwise I would have been totally freaked out). Going back to my toddler years, I was actually afraid of the Sesame Street All-Star 25th Birthday: Stars and Street Forever! special that my parents taped. I would always run out of the room crying whenever my older sister chose to watch it. Now, I'm not exactly sure what it was in that special that frightened me, but according to my mom, it was the way Mr. [Ronald] Grump would scream, or the fact that he was going to destroy Sesame Street. In addition, there were 3 aspects of Learning About Numbers that used to scare me when I was a toddler. The first was the Four Big Lions At My Door song (the way the lions opened their mouths/jaws and how their teeth were showing when they roared was a real fright for me). The second was the beginning of the skit where The Count hires Ernie to answer his telephone (it was how we had The Count's "entering organ music" played over the interior of his castle). The third aspect was the skit where The Count counts 7 flowers (it was how pitch black the background was, how The Count entered the scene like any vampire would, and of course the "entering organ music"). Now, don't get me wrong; while I didn't have a problem with the 1972-1982 Count puppet, it was just the aspects of those 2 skits that really made me very unsettled. This is all I can think of for right now. Yikes! That insert DOES sound pretty creepy! I used to be scared of the skit where Ernie pulls off Bert's nose to complete his sculpture of Bert's head. But now I find it absolutely hilarious. When I first saw the Pinball Number Count #2, I totally flipped out at the clown's face and when when the bat flew up to the screen. 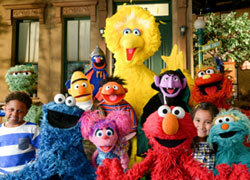 Call me weird, but I also got scared whenever Big Bird or Oscar widened their eyes directly at the camera. Go figure. Since you mention that about the Count, I should say I remember finding one of his sketches "disturbing" as a kid. It's the one where Ernie is at his castle (got a job working for the Count??) and the Count tells him that all he has to do is answer the phone. But each time the phone rings, the Count prevents him from answering because he wants to count the rings. As I recall (though I haven't seen it since I was a kid), it actually becomes physical and not in a slapsticky way...I remember the count's voice sounding serious and determined. I wasn't scared of it really, just sort of mildly freaked/angry. Looking back, I think it's funny actually as karma caught up with Ernie for messing with Bert all those times. At this time I'd also like to submit my membership for the "Can't Stand Harvey Kneeslapper" club. I fully qualify, I assure you. Nothing frightened me really, I was more interested in how the puppets worked rather tahn scared of how they looked or sounded.